OK, due to the unforgiving CLAMORING of all you goth bookworms out there, I’ve decided to do a little more work and graduate this post to a full-fledged Gothic bookend list. I get it already, you guys want more super unique bookends for all your awesome Gothic classics. So here they are in all their awesome glory. Make sure to check out the pics I’ve posted below and make sure to get an eyeful… thankfully, none of these unique bookends scrimp on the detail! This is the original set of awesome that started this post in the first place! 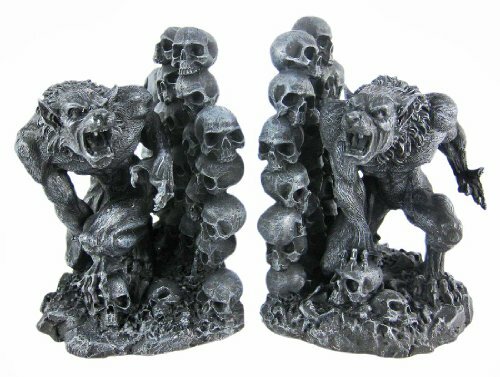 Bring any shelf to life with the addition of these Snarling Werewolf/Wolf-Man unique Bookends! Are you kidding me?? I’d buy these bad boys to prop up myGoth record collection too… THEY’RE TOO COOL TO PASS UP, FOLKS! Check out the awesome detail on these werewolves, snarling over the skulls of their most unfortunate victims! They’re almost as gruesome as the real thing! They keep your little brother at bay and away from all your Young Adult Paranormal hardcovers (my toddler is scared to death of ﻿﻿werewolve﻿﻿s! HAHA what a sucker!). NOICE…. Just a couple of cool dragons perched on a castle roof! Remove the books to positions these unique bookends into place and form the complete castle roof. Please take note of the different tail positions…. LOVELY. 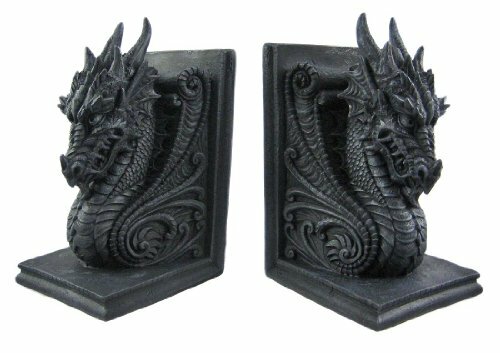 Fresh off the last post about Gargoyle Statues for your Gothic Abode, I bring you these two stunningly attractive individuals! Alright, these unique bookends are EASILY my favorite of the lot. This dragon has got MAJOR smolder going on! Not to mention the detail is just striking to say the least. It ain’t priced to high either so it’s an overall great deal. 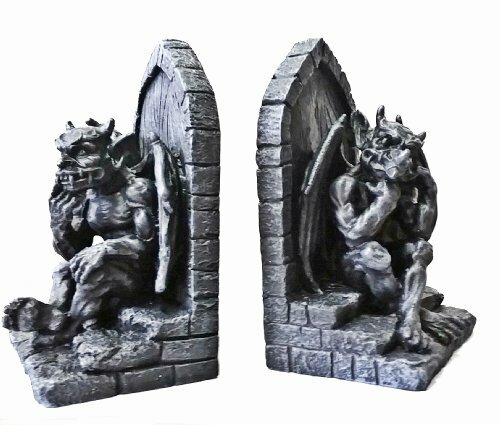 These unique bookends are also modeled after gargoyles but they are in a different style from the other gargoyle set on this list. 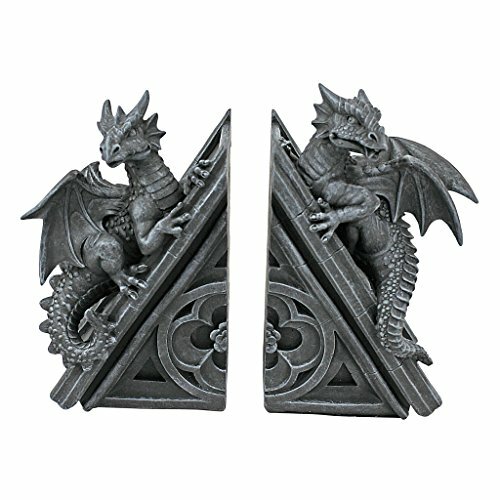 These use a more traditional gargoyle look overall and actually look like something you’d see on an actual building! You gotta love the cut stone appearance in the last pic. To me, this kind of attention to detail makes all the difference! Another dragon model?? 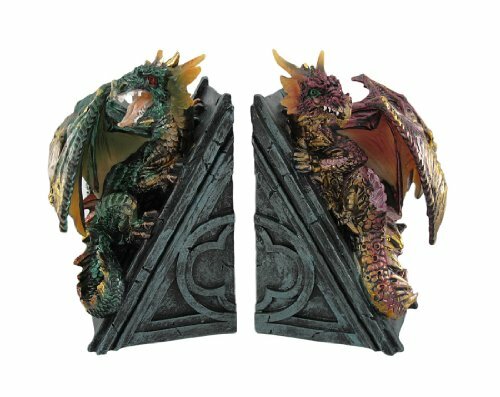 These particular unique bookends are awesome though because the dragonss are painted in bright metallic colors. If I’d ever have the chance to see a dragon myself, I’d have to imagine them this way, with all the slimy, shiny scales you’ll ever need! This set TOTALLY reminds me of The Desolation of Smaug by the way. Just sayin’. 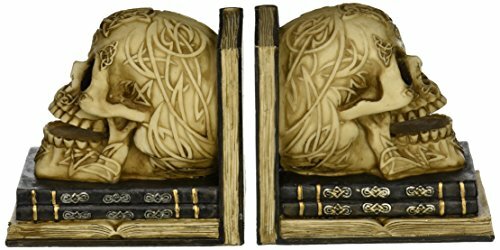 Another wonderful option for any Goth’s library are these pair of skulls bookends! These unique bookends are propped up against some old spell books and appear carved with several Celtic runes﻿ and symbols. VERY cool indeed. All jokes aside, the armor and weapon details on these knights are all here in spades and this particular design is a nice breather from the others, come to think of it! 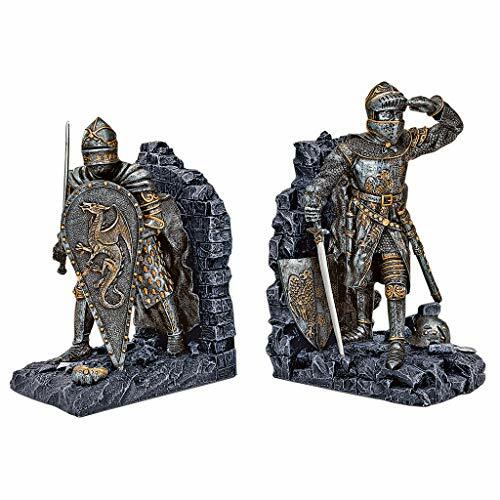 Besides, if you have a surplus of dragons in a unique bookends available online list, its only natural to have a couple of knights as well, right? Lastly, I couldn’t help but go a little zombie on y’all! 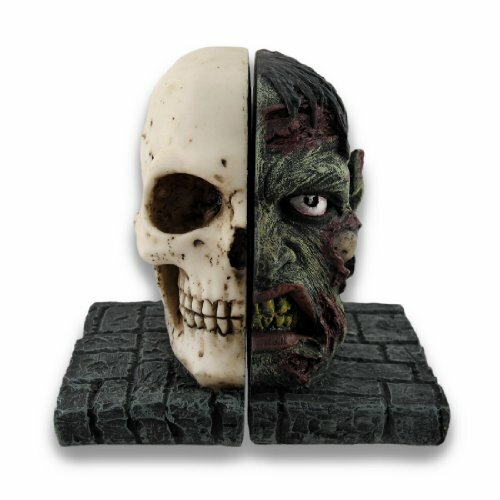 These unique bookends are fashioned to be a split face and skull! Kind of like the chicken and the egg argument if you ask me, hehehe Whatever the case, the books between them will look great for sure. I just love these things so much… and you guys too! All you goths reading my awesome blog really give me a reason to get up every morning. So, you guys are getting an extra! These are adorned with cool pentagrams! What else do you need?? They actually look very similar to your average bookends but they added all the Gothic bells and whistles to give these unique bookends some killer character and I love them to pieces! If you’re like anyone else in the modern world, you’re probably not too familiar with the average “book” anymore. That doesn’t mean a set of unique bookends wouldn’t be of any use. Why, you youngsters could even line up all your old iPads between them and call it a day. So do yourself a favor and pick one of these bad boys up! Keep your most treasured novels upright and out of the way with these cool and unique bookends! Take the plunge, get a couple of awesome bookends and live Gothic today!